Heavy duty 210D nylon backpacks in various colours from stock. All of our premier nylon backpacks are sold per bag. 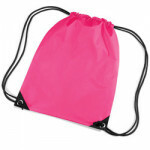 Printed nylon backpacks available from 25 bags printed single colour. More colours of nylon backpacks available upon request. Chocolate Premier Nylon Backpacks 340x450mm Sold per bag Chocolate ny..
Fuchsia Nylon Backpacks 340x450mm Sold per bag Fuchsia nylon backpac..
Grey Premier Nylon Backpacks 340x450mm Sold per bag Grey nylon backpa..
Kiwi Premier Nylon Backpacks 340x450mm Sold per bag Kiwi nylon backpa..
Olive Premier Nylon Backpacks 340x450mm Sold per bag Olive nylon back..
Burnt Orange Premier Nylon Backpacks 340x450mm Sold per bag Burnt ora.. Pink Premier Nylon Backpacks 340x450mm Sold per bag Pink nylon backpa..
Purple Premier Nylon Backpacks 340x450mm Sold per bag Purple nylon ba..